I* Color starting to drop at faster rate than I* Tone (future color imbalance predicted). Yellow still weakest ink, but much improved stability compared to older K3. 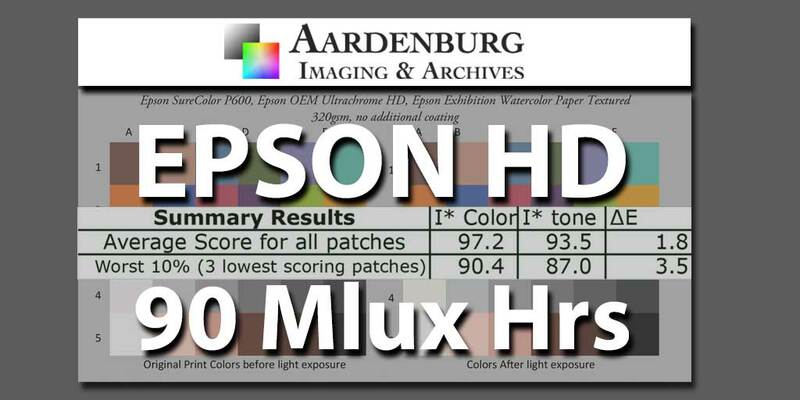 The 90 Megalux hour test results for the Epson SC P600 printer with UltraChrome HD ink printed on both Hahenemühle Photo Rag Pearl 320 gsm paper and Epson Exhibition WaterColor Paper Textured 320 gsm have been posted to the Aardenburg Lightfade Testing Database. The best way to navigate directly to the comparative test results in this study is to use the database table filter. Type “N1” into the “Batch” field. This will gather all six pertinent samples in this study which were all started as batch N1 at the same time on the same light fade testing unit. You should find sample ID#s 312 and 314 in this group of six samples. They are the Epson UCHD ink samples. Click on the “+” symbol located beside each ID# in the ID column of the database to expand each sample row individually, and locate the test report name on the first line of of this expanded window. Clicking on the green highlighted test report name will then navigate you to the download page for that specific PDF report. Once you reach the download page for that test sample, clicking on the report name again will download the full report. That’s the way the database works for all test samples in the Aardenburg light fade database, folks! The download page may seem a little redundant at the present time, but in the near future we will be adding “executive summary” information on that page to help members ascertain what the main findings are before downloading the full test report. Compare these test results to sample ID#s 311 and 315 for a direct comparison to the older K3 Ultrachrome set. These samples were also printed on the same paper batches using an Epson Stylus Pro 3880 printer. 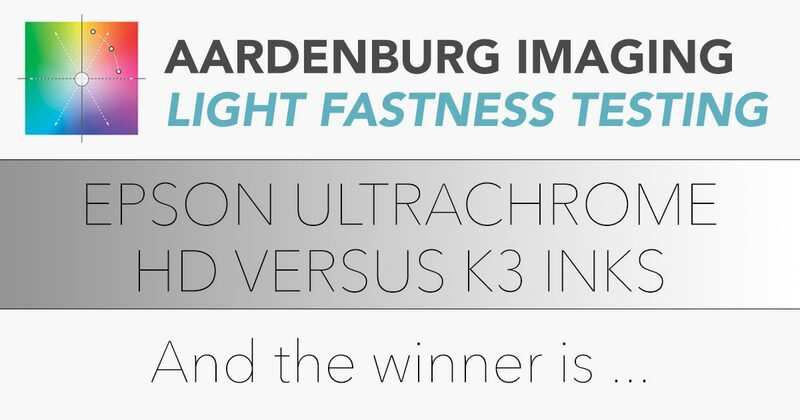 The I* metric analyses are clearly demonstrating the light fastness superiority of the new UltraChrome HD ink compared to the older UltraChrome K3 ink set. The samples printed with Epson Ultrachrome K3 have reached both upper and lower Conservation Display Rating limits: 55-82 Megalux hours on Epson Watercolor Textured paper, 59-83 Megalux hours on Hahnemuhle Photo Rag Pearl 320gsm. Epson Ultrachrome HD inks and Canon Lucia EX inks are passing both lower and upper Conservation Display Rating limits at the 90 Megalux hours exposure interval. Any idea when the next ID #314 (100 Megalux hours) results will be posted? Thanks in advance. Great to hear from you! We have collected the test data and evaluated the results at the 100 Mlux hour exposure interval for both samples using the latest Epson UCHD inks (#312 and #314) as well as the samples of the older Epson K3 and Canon Lucia EX inks printed on the same papers that were put into testing at the same time as direct comparison tests. That said, the results have not yet been published for two reasons. First, I have had to scale back the work product and publish less frequently as a cost savings measure. We are incredibly grateful for the donations we receive here at Aardenburg, but they don’t come close to covering the true costs of the work. As I ease into retirement this year, covering the research budget shortfall from funds obtained through additional consulting work isn’t going to be an option any longer. Going forward, this research will have to stand or fall on its own merits. Second, and important from a technical perspective, the 100 Mlux hour data revealed a noticeable departure from the projected linear trendlines we originally reported on the basis of the 60 Mlux hour data. I want to confirm this non linear departure (i.e. possible downturn) with additional data from the next exposure interval. These next measurements take place at 120 Mlux hrs in mid May, 2017. I will try to publish all the results to date soon thereafter and also update our original Epson HD trendline article as well.